The 11th edition of the annual gospel concert dubbed ‘Celebration of His Grace’ concert was launched yesterday at the premises of the TV Africa in Accra. The praise and worship live musical concert will take place on Sunday, September 23 at the National Theatre in Accra at 5:00pm. The event, which is being organised by Presence Ministry, will bring together performing gospel music giants on one platform to celebrate Jesus Christ and entertain Ghanaian gospel music fans. The concert, according to Bernard Amankwah, will bring Christians together on one platform to witness spectacular performances from some selected anointed gospel stars like Edith Marfo, Edwin Dadson, Selasie Osborn, Nii Dowuona, TY Crew, The Multimedia Choir, Divine Mercy Drama Ministry and a host of others. 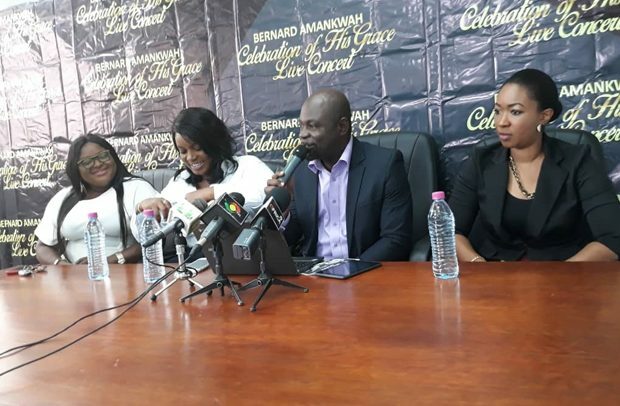 Speaking at the launch, Bernard Amankwah, who began his musical career with International Central Gospel Church (ICGC) choir 25 years ago, pointed out that the concert is being organised to thank God for what He has done for him throughout his career as a musician and also to celebrate his achievement in the music industry. He hinted that this year’s event patrons should expect an experience of a lifetime, adding that the concert is also an outlet for many others who have also been blessed in other ways to turn up and rejoice with him and all the musicians billed for the event. According to him, proceeds from the show will be used to support the projects being under taken by his foundation. He, however, revealed his plans of providing boreholes for the residents within the Krachi East District after the concert. Bernard Amankwah is credited with several hit songs such as ‘Presence’, ‘Presence II’, ‘Almighty’, ‘The Glory Has Come’, ‘Holy’, ‘Mercy Rescued Me’, among others.